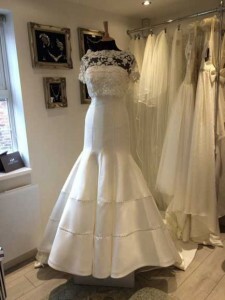 Maria Morris Couture, based in Gately near Stockport, recently secured a starring role on ITV soap Coronation Street, when two of the brand’s exclusive wedding dresses were worn on screen by Carla Connor (played by Ali King) and Kate Connor (played by Faye Brookes). The episode aired on Monday, December 21. Carla Connor wore the Anya design, a dramatic wedding gown with a structured mermaid silhouette and exaggerated train. The beautiful banded skirt flares out to a full fishtail and is highlighted with thousands of hand-°©‐applied Swarovski crystals. The dress was created in rich zibeline fabric, (sometimes known as mikado) which is a key trend for 2016. Gorgeous and rich, it adds structure and drama to the look. Character Kate Connor wore the Estelle design, a romantic dress with a mermaid silhouette. Pure silk duchess satin is draped to form the bodice and long panels of the dress, which is then overlaid with embroidered tulle in shades of ivory and silver. Swarovski crystal drop beads decorate the edges of the double flounced sleeves and under the bustline, to add an elegant sparkle. Both dresses are exclusive handmade designs by Maria Morris Couture and will be on display at Bride: The Wedding Show at Tatton Park in Knutsford on Saturday and Sunday, February 6 and 7, 2016.